To help you advertise your new website to your members we've developed postcards and refrigerator magnets that are specially branded to match the look of your website. Our expertise helps you with more than just your website! Why is branding for our organization important? It is said that a brand resides in the hearts and minds of people who interact with a business. In your case, your business is both your members that make up your church and your physical presence in the community. The more you show a consistent brand to those you interact with, the more value it creates for your image. What printing services do you provide? All of our printing products are printed in full color and on quality paper. They are also designed to your specifications. We suggest branding them to match your website. 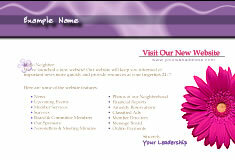 Our print items include business cards, postcards and refrigerator magnets. How does our church benefit from your printing services? The key benefits are improved communication with your members and value for your church's brand. If your website was recently launched, now is a perfect time to get the word out to your members and build the excitement. The more your members know about the features of your website, the more they will visit which in turn helps you benefit even more from your new website. 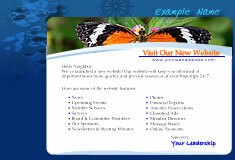 Our printing solutions are not only for newly launched websites. 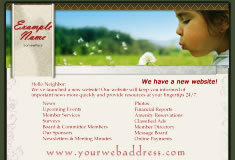 Utilize postcards to announce special events or refrigerator magnets to welcome new members to your church. Do we get to customize the design? Absolutely. As a starting point, we will first create a design for you that matches the graphics of your website along with our suggested text. We will then modify the design to better fit your needs. The price is a flat fee based on the quantity ordered. It includes the custom design, proofs, printing and ground shipping. Will you also mail our postcards to each address? Yes. If we are printing your postcards we can also label and mail them directly from the printer. We will provide you wish an Excel file for inputting your recipient data. Plus, you receive discounted first class postage rates. Once you place your printing order we'll have an initial design created and ready for your review in a couple days. After that, we'll take care of your design modification requests until you're happy with the final product. Once you've approved the design, we'll send the graphic files to our printing company who will print your items the next day. The items then will be ground shipped directly to you. What if we aren't happy when we receive the items? If there's something wrong with the quality of your printed items we'll certainly want to address the problem with the printer. We'll ask that you fax or mail us a sample so that we can point out the issue. We'll have the issue corrected and have new items sent to you free of charge. If the problem originates in your review and approval of your design proof we'll work with you for a equitable solution. By popular demand, we now offer direct mailing services for your postcards. Not only do you save the hassle of labeling and mailing but you also receive discounted postage rates. Mailing services include: Processing your properly formatted Excel file with names and addresses, individually labeling each postcard, USPS address verification, postage and delivery to the post office. Any excess postcards that were printed but not mailed cannot be returned to you. These fees are in addition to the pricing for double sided postcards.